I recently gave a talk at work about git. I created a cheatsheet based on Steve Tayon’s Clojure Cheatsheet. 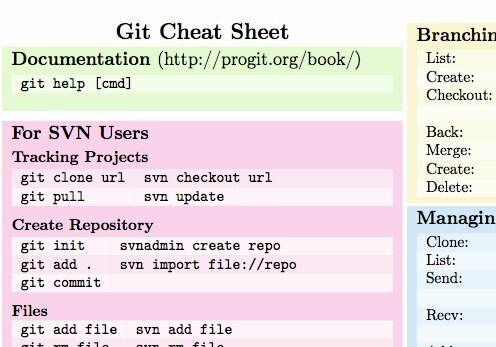 I realize there are a number of cheatsheets for git already. However, I wanted a simple, one-page sheet specifically for my attendees. Like it? Hate it? Find a typo? Leave your feedback in the comments! git config --global user.name "Nate Murray"
git config --global user.email "nate@natemurray.com"
git commit -m "added version one of the file"
the concepts we're going to talk about is really important for branching. draw the picture. point out the parent connection. note here there are two blobs! * git stores reference to first file. * A commit in git is a snapshot of the entire project, not just a list of diffs. text file with a sha. thats it. update diagram by adding a `ref` to our commit. (`master`). How does git know what branch we are "on"? checkout means something different in git than it does in svn. checkout in git to switch our working directory to a particular commit. git commit -a -m "updated the readme"
git commit -a -m "applied important fix"
If you are working on a particular feature, create a branch. If you're coming from svn, making frequent branches might seem unnatural. in svn, a branch is global -> namespace issues. But branching itself isn't that useful unless its easy to merge. * how many of you have merged a branch in svn? * how many of you enjoyed it? git commit -a -m "changed the fix"
git commit -a -m "improved the fix"
there are many diff viewing tools. I don't really like using the visual tools. Everything so far on one machine. want to share our changes. might seem scary or messy because changes to totally independent lines of the code. but in practice its not a problem. no easy way of merging two separate repostories. git blob identifiers are a SHA of the content. To be able to collaborate with others you have to manage 'remote repositories'. When you clone a project, you have a default remote called 'origin'. Remotes are pointers to other repositories that are _usually_ over the network. git commit -a -m "make a change"
which means pull from origin whatever branch Im on (i.e. HEAD) into this branch. I can't push unless I pull first. This is good. So that is while we are on the same line. What if were on different lines? `fetch` brings his commits into my repo but again, doesnt change my working copy. work with those branches just like any other branch. git merge bh/master # don't press enter!!! But lets take it up a notch. say you didn't want to merge bh changes in your master branch. don't want to mess up your master branch. * then we're going to merge to master. and there we go! merged nicely. * independent lines of work can go on. * If someone creates something good in their branch, they just tell people about it. This is true. Thanks for pointing that out! Thanks for this sheet, printing it right now!